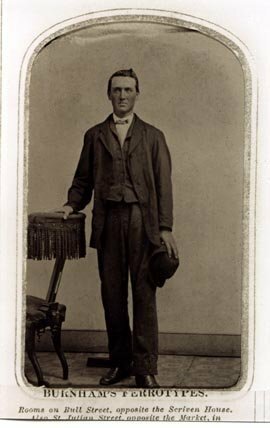 John William Tuttle was enlisted for a period of 3 years on September 14, 1863 by Capt H.K. Harrison in Georgetown S.C. He was in the same unit as his father, Robert, Co. B, 21st Battalion, Georgia Calvary (Banks Partisian Rangers). On February 13, 1864 Private Tuttle was transferred to Co. E, 7th Georgia Cavalry through consolidation of units. He appeared on the register of Receiving and Wayside Hospital, General Hospital no. 9, Richmond, Virginia in August 1864 and was "Released for Duty" later that month. Private Tuttle continued with the 7th through the end of the war at which time he returned home. John William Tuttle died in 1914 and is buried in Goshen Cemetery, Goshen United Methodist Church, Rincon, Ga. The information and photo was contributed by Robert T. Tuttle Jr., GG-Grandson of John William Tuttle.